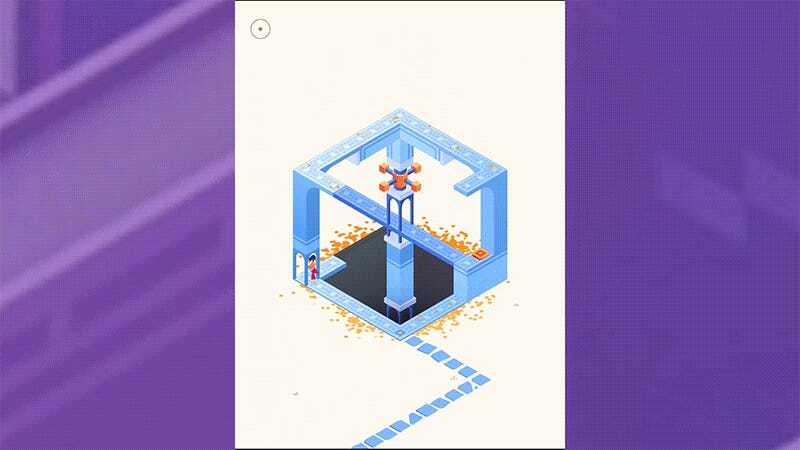 Ustwo’s perception puzzle adventure Monument Valley is one of my favorite mobile games. The sequel popped up earlier this week as a surprise announcement during Apple’s WWDC keynote, and it’s every bit as beautiful, relaxing and enjoyable as the first. The original Monument Valley told the story of Ida, a lost princess wandering a world inspired by the works of M.C. Escher. By twisting and turning elements of the game’s levels, players help Ida find her way through the mysterious valley, discovering her purpose in the process. Monument Valley 2, available now for $4.99 on iTunes, is about a different sort of journey—the journey of a parent and child. Players begin the game controlling a character named Ro, whose daughter literally follows in her footsteps, at least at first. As the game progresses the daughter becomes more independent. First she’s a simple AI that attempts to close the distance between herself and her mother as efficiently as possible. Next she’s a fully independent character controlled directly by the player. Our little girl is growing up so fast. If I think too much about it, it reminds me of how quickly my own children are growing, which is one of the happiest and saddest things a parent can ponder. Featuring thoughtful puzzles, a lovely visual flair and some excellent ambient music, it’s easy to put those heavy thoughts aside and just chill with Monument Valley 2, as I did in on Facebook earlier today. Check out the stream archive below. It’s ASMRiffic.